Mice continue to be one of the most popular "pocket pets", a term used with small pets that will fit into your pocket! Mice are great pets for several reasons. They are small, inexpensive, and very easy to care for. They are very clean animals that continually groom themselves by licking and combing their fur. Female mice are odorless. If they are well taken care of and handled often they can become very tame and enjoyable. They are a great first pet for children. Dr. Jungles says..."this is the perfect pocket pet!" Mice are the smallest mammals to ever be domesticated, and mouse breeding is an ancient hobby. The common mouse is a curious little creature that makes a very interesting companion. (They are also very cute!). They have a life span of 1 to 3 years. They not only captivate our imagination but mice play a very important part in history as well. One of our favorite mice is Mickey Mouse who has delighted us since the late 1920's. The mouse is a very adaptable creature who can thrive in almost any environment and has resisted mans' attempts to eradicate it for centuries. Mankind has learned a lot from studying mice and using them in a variety of situations to determine what would happen to people in the same situation. They are not only interesting, but educational! are the "Pet Mice" or "Fancy Mice"
House Mice originated in the central and southern parts of Asia, but are very adaptable and have spread all over the world. The Pet Mice or Fancy Mice are domesticated forms of the House Mice. In Europe and Asia people began to exchanged mice for their fur and coloring in the 1800's and the term "fancy mice" came into use. In about 1900, Walter Maxey and other mouse fanciers formed the National Mouse Club in England and "fancy mice" have since been kept and bred as a pet. Mice have been used for many purposes over many centuries. The word "mouse" comes from a 4,000 year old word 'mush' which means 'to steal'. In the orient, mice were used by the Chinese in religious rituals as early as 1100 B.C., referring to them as the "ancient one", while the Japanese believed them to be a messenger from the gods. Greeks used them to predict the future and even worshipped them, sailors and miners used them to test air quality in submarines and mines, science uses them to study genetics and disease, and they have even been sent to outer space. Mice weigh on average 1 ounce and are approximately 2.5 to 3.5 inches long (without the tail). The fancy mice or pet mice are a domesticated form of the wild house mouse, of which there are a number of different subspecies. Today there are many different varieties of pet mice or fancy mice. The most common domestic mice are the white albino ones which were (and still are) used in laboratories. Various other mice strains have been developed in laboratories from inbreeding. These various strains will have individual characteristics such as being a more long lived mouse, or one that tends to develop more tumors, or needs a specialized diet, as well as other traits such as being more temperamental, more nippy, or more flighty. There are some unique strains of mice! One is known as the "waltzing" or "shaker" mice, or sometimes the "Japanese" mice as they were first recognized in Japan. These mice are defective in their balancing ability and appear to "waltz" rather than move about as normal mice do. Another is the "singing" mice that make a faint twittering sound that is distinct from other mice and makes us think of singing. Pet mice are available in several colors and patterns due to specialized breeding by mouse hobbyists. Actually there are more than 70O color and coat varieties. Coats can be smooth, curly, longhaired or even a combination of these. The most usual color variations include brown, black, tan, gray and albino with both lighter and darker shades of these as well. There are many different cages available for keeping mice as pets. One of the best kind is a glass terrarium with a wire top. When considering where to put your mouse cage, think about what problems could arise by putting it in different places. You shouldt put it directly in front of a window, as sunlight tends to annoy mice and make them very uncomfortable. You also shouldt put it where drafts are, because this also could result in sickness. Keep it up on on a table or stand where it won't be easy to knock over, but where people will be able to readily reach and view it. Make sure they have a good soft bedding of wood shavings or prepared litter. Corncob bedding obtained at pet stores works well as do beddings made of recycled paper and cardboard. Wood beddings provided by most major suppliers are simply kiln dried natural wood products. Generally it is best to not use beddings with additives. Chlorophyll bedding has chlorophyll added to give it a clean, fresh aroma. It is green and so not recommended for white small animals as it will discolor their fur. Wood shavings should be used in cages that are open with good ventilation, rather than enclosed containers. Cedar shavings should be avoided as it is more aromatic and there is concern by some that this or possibly the natural resins in cedar may be harmful. Some small animals can develop allergies due to the dust in moldy hay or in bedding. Mice are nest builders and will make nests from their bedding to sleep in and have babies in. For water, you can use a water bottle with a hanger that allows mice to get water whenever they are thirsty. Clean cages thoroughly with hot water at least once a week and change the bedding at least twice weekly. Mice need a completely balanced diet. This includes carbohydrates (whole oats, hay, stale bread), vegetables (lettuce, carrots, peas, etc), and protein (such as dog biscuits). An easy way to feed mice is to get the formulated mouse foods available at pet stores, which have all the vitamins and minerals that mice need. Mice do enjoy treats, and things such as fresh vegetables, sunflower seeds, cheese, jam, and fruit and grain bars from pet stores will be much appreciated. Feed them once a day in a small china or pottery dish and remove any uneaten fresh food at the end of the day. Clean the food dish thoroughly with hot water at least twice weekly. Mice also have constantly growing teeth, and so should be provided with something to chew on to keep them in good chewing condition. Hard nuts, such as acorns and walnuts work, and also flavored wood sticks from pet stores. Make sure that mice have a constant supply of water. Commercial water bottles are probably the best choice. Mice are very sociable creatures and like to have company. One mouse can do fine as a pet, but they appreciate having friends of their own kind as well. Most mice get along fine with each other, but you should watch out putting males together (unless they grew up together), because they will tend to fight, especially if females are present. Usually females can be put together with no ill effects. Mice are great with children, but they should be kept away from the other pets of the house (dogs, cats, birds). They should also be kept away from other rodents such as rats, because rats are their natural predators. 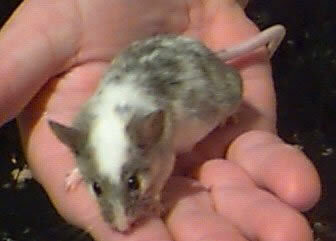 Mice generally become tame pretty quickly and are easy to handle and hold. The best way to pick them up is to grab the middle of their tail gently and then place them in the palm of your other hand. If they are very familiar with you, you can pick them up directly. Mice can be taught simple tricks, such as taking food from your fingers once they are comfortable with you and even retrieving treats from your pocket. With lots of patience, they can learn even more sophisticated things such as climbing ladders, walking "tightropes", racing, and traveling through mazes. Of course, one of the best ways to train them to do simple tricks is to reward them with a treat every time they do something right. Nocturnal by nature, mice usually spend more time sleeping during the day than at night. They are extremely active and love to exercise and play. Exercise wheels are great for mice because they will occupy their time and keep them healthy. You can purchase or make tubes, ladders, and climbing blocks also. Mice also like to chew. Not only is this beneficial to keep their always growing teeth trimmed down, it is a favorite activity. Be sure they have plenty of chews, sticks and twigs. They also like to hide, so giving them cardboard boxes or nest boxes will give them a place to go when they want to sleep. Of course they will probably also chew up their boxes, so be sure to replace them from time to time. Mice will spend quite a bit of their time sleeping! If you are planning on breeding your mice, then you should get some nesting material to put in one corner of the cage. This can usually consist of something like grass or hay. You should have one male in the cage - no more! If there is more than one male mouse in a cage, then they tend to fight. There can be as many females as you like as they always get along with each other and will actually help take care of all the babies, not just their own. Female mice reach sexual maturity at about 6 weeks old, and males take a week or two longer. Females can have up to 15 litters a year, and can become pregnant within 24 hours after giving birth. So if you don't want more babies immediately after the first litter, it can be a good idea to remove the males. However, males can be kept with the females after the babies are born as they will not harm the young (and often actually help to babysit!). When baby mice are born they are deaf, naked, and blind. Within two weeks the babies will look just like their parents, just smaller. They may be weaned in approximately five to six weeks. Mice are hardy resilient animals and rarely get sick. However, if not taken care of properly they can become ill. Most ailments are preventable simply from taking proper care of the animal. Signs that your mouse is sick include such things as not eating/losing weight, dull coat, runny eyes and nose, and huddling in a corner not appearing active. In general, if you notice your mouse is sick make sure to completely clean and disinfect the cage and change the bedding. Make sure it has plenty of food and water and isn't in drafts or damp conditions. Respiratory Infections/pneumonia: The indications that your mouse has a respiratory infection or even pneumonia are runny nose, lack of appetite, inactivity, weight los,and labored breathing. Respiratory Infections are generally caused from being in drafts and/or damp bedding. Make sure he is taken out of drafts and the cage is completely clean and dry, and place a dry cloth over the cage. Pneumonia will require an antibiotic therapy, and possibly a visit to a veterinarian. Asthma: This is usually attributed to an allergic reaction to dust, especially the dust of moldy hay. Provide a clean dry environment, and always replace damp hay and beddings. Fits: Sometimes a mouse is prone to fits, where it dashes around in circles until it falls down exhausted. There is no apparent reason for this and no known treatment. Diarrhea: If your mouse has watery droppings and appears to have diarrhea, then the cause is most likely from having too many fresh greens and fruits. The simple remedy to this is to remove them completely and not feed the fresh foods at all for a few days until he appears to be getting better. Then slowly re-introduce fresh food every few days. Mites/lice/parasites: Generally dirty conditions may provide breeding places for these types of pests so make sure and provide a dry, clean environment. Completely clean and disinfect the cage. Mites are especially harmful to mice and will cause a loss of fur and encrustation of the skin. Many blood sucking parasites can be eliminated with special powders available from a veterinarian or pet store. Skin Diseases: These are fungal diseases where there are small areas of hair loss and scalyness. Generally this condition is contracted from children who have ringworm. It is best to go to a veterinarian for this. Ear Infections: Often indicated by a mouse walking in circles or with its head tilted. This is usually caused by an inner ear infection or by parasites. A drop of mineral oil on a cotton swab will work to wipe the ear and may provide some relief. See a veterinarian to determine the cause and for treatment. Cancer(tumors): The most common form of cancer is mammary tumors. These are generally attributed to old age or viral infections. Keep your pet as comfortable as possible and provide the best nutrition possible. Pet mice are readily available. When purchasing your mouse, you should look for an overall healthy appearance and alertness. It should have a long body and clean head, smooth and not bumpy, and should arch a little over the loins. The fur should be sleek and smooth. It should have large bold eyes and ears that stand erect and be scoop shaped. The tail should be as long as the body, wide at the base and tapering to the end with no kinks. I was looking at getting a pet mouse and had a few questions. Is it okay if the environment of the mouse changes frequently? My parents are divorced and i go week to week and was wondering if the mouse could travel with me or if it would affect the health of the mouse? If the pet mouse's home (cage, toys, hides, etc.) go with you, the mouse should be fine. Stress would be more likely to happen if it has to constantly change cages environments. If you have two ar more it would help if there getting stressed. Most mice would like changing environments anyway becouse they love to explore. I have 5 female mice and they love going different places. Hi I would like some advice please. I have two female mice who I have had for 6 weeks. Two weeks ago, one of the mice started scratching her ears and eyes a lot, until they bled. She was also losing weight and spending more time sleeping and was wobbly on her feet. I took them to the vets and she was given an injection to treat an ear infection in case that was what was making her wobbly and to stop the itching. I have also changed from sawdust to paper bedding and used some johnsons tea tree animal balm on her itchy ears. Nothing seems to be making any difference. The last few days when I have had her out of the cage she has been making a weird noise which sounds like her teeth are chattering together. It is only one mouse that is affected, the other is lively and healthy Please can anyone give me any advice on what could be wrong with her? And how to make her better? I don't know if it could be a respiratory illness or an allergy. Hi. I'm very interested in breeding mice for feeders and I was wondering if you'd be able to ship the mice to WI. If you could let me know whenever your earliest convenience is, that'd be great. Thanks! Hi, I am looking for a pet mice, preferably a male [healthy], color not a preference...but the problem is I am in India, staying in Bangalore....I have not been able to find one in my location. Can you help me in finding a place where I can order or get a pet mice. I don't mind if it has to be shipped to me..